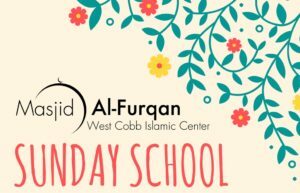 We are very excited to announce the start of the 2018-2019 Masjid Al-Furqan, West Cobb Islamic Center Sunday School Open House and Registration on Sunday, August 5, 2018, from 11:00 am – 1:00 pm inshaAllah. Classes will start on Sunday, August 12, 2018, and be held every Sunday (except for holidays and summer) from 10:30 am until 2:15 pm inshaAllah. Parents of children ages 5 and above may register their children in person on Sunday, August 5, 2018, anytime from 11:00 am until 1:00 pm at the Sunday School building office inshaAllah. Please find below the Registration form, Rules of Conduct, and School Calendar for your review. If you have further questions you may email Br. Asif Edrish at education@wc-ic.org.